Check to make sure everything is going off as planned and that you've avoided enemy bullets. Become the Gunslinger! But will you be the Wild West's richest bandit? 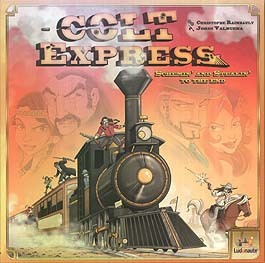 Fun programming game with a Wild West theme. Players programme their bandits movement/action cards and try to manoeuvre their way around the Colt Express train, picking up money and jewels, avoiding the sheriff and battling with the other bandits! As a programming game there will of course be plenty of chaos, but I find there are many other qualities here which make it more fun than other programming games. For example, each player character has a special ability which you will end up using a lot to your advantage in the game. I also like the way each game is split into sections with a different event card which will determine a special rule for that particular round. For example it could mean that any bandits on the roof are swept to the caboose at the rear of the train, or that the train is braking so all bandits on the roof move one car closer to the loco. It all adds extra depth and flavour and gives you more to think about. I've played this with 6 and it still plays fast and is lots of fun. The game only proves to be frustrating if you're not picking up the cards you need at the start of the round, which has happened to me a couple of times. There are expansions available which I haven't played yet but I think they will be a good idea to add more cool content into the game.